This t-shirt is funny and why you wonder? Simple just read the text, it says “Here I am. What are your other 2 wishes?” and that is all you have to know. It will make people smile and you can read this is so many ways that it keeps being funny. If you are being followed by a zombie then maybe you should think about getting this t-shirt. 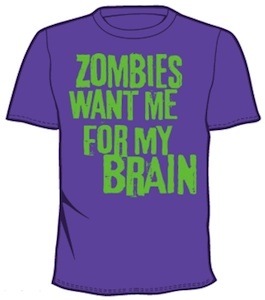 This purple t-shirt says in green letters “Zombies want me for my Brain”. You may wonder if they want your brain because you are so smart or maybe because you are so dumb. Any how this t-shirt comes in tons of sizes for XS to 3XXL so you size should be there. And the graphics are printed on an American Apparel t-shirt so the quality should be great to. So keep running for those zombies but do it in your own Zombies Want Me For My Brain T-Shirt. YES the shirt comes in guys styles to and even different colors although I like the red best. So you know what to say and how to say it all the time? If so then maybe this is the t-shirt for you. 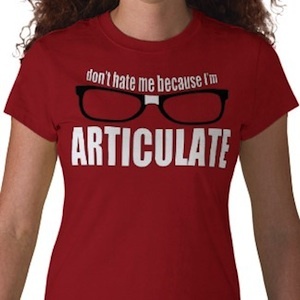 It says “don’t hate me because I’m ARTICULATE” and a pair of glasses. That could be you and if so then you should just get one. Or even better you can give it to someone as a gift because they are so articulate. Check out all the version of this Don’t Hate Me Because I’m Articulate T-Shirt. We can’t have enough breaks and specially coffee breaks are important and that is why you should get this t-shirt. 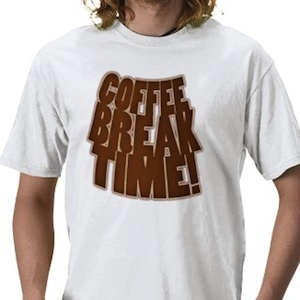 The t-shirt says “Coffee Break Time” and that twill make everybody who see your shirt want coffee. A great shirt to wear when you work in a coffee place. Wait no longer, grab a coffee and go get your own Coffee Break Time T-Shirt. This t-shirt has a clear message for the people who see you. It says “Sorry I’m Late” so if you are late often then maybe this could be the shirt you just need to have because now you can stop saying sorry because the slogan on this t-shirt will do it for you. And if you are late very very often then you can get a different color for each day of the week. 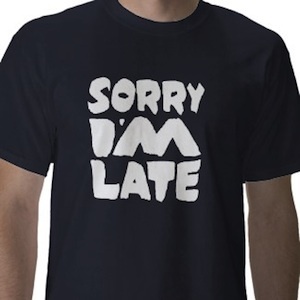 Check out this Sorry I’M Late T-Shirt. This nice t-shirt says “It is what it is” not much to add there just a great t-shirt with a great slogan. 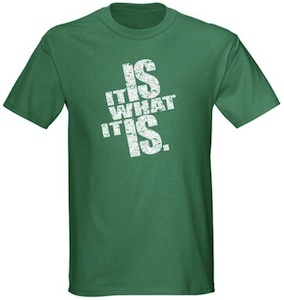 Go check out It Is What It Is T-Shirt.